Wealth is what we reserve for ourselves, worth is what we offer to the world. What are you worth? This question typically evokes a quick back-of-the-envelope calculation involving the sum of our home equity, bank accounts, retirement funds, stock portfolio, a few expensive items that might attract buyers in a pinch, minus our financial obligations. But this is wealth, not worth, which in all other cases is a reflection of value to others. Why is Apple Inc. worth over $360 billion? Because its unique products (and the hip lifestyle they imply) are desired by millions (billions?) of consumers worldwide. The price of an iPad reflects little on its costs of components and assembly, lots on what the market will bear. Similarly, the price of a renovated apartment in Paris’s 16th arrondissement or a reconditioned 1963 Corvette says little about the materials and hours involved in their construction and restorations, and everything about their perceived value to interested buyers (many) and availability (few). The San Francisco Chronicle heralded (remember that word) the Bay Area’s 25 richest individuals recently, and the list was heavily populated by founders of technology companies: Larry Ellison, Gordon Moore, and Steve Jobs to highlight a few household names. Most on the list could be labeled fairly as both worthy and wealthy, if just for the numbers their companies’ employ and positive impact to economic growth through the years enabled by their ingenuity and hard work. But, one doesn’t have to be wealthy to demonstrate incredible worth. First responders on 9/11 come to mind. So does Margaret Finley. She fostered our 3 children and thousands of others as the principal of our neighborhood primary/middle school in San Francisco. When I first met Margaret on a gottafindmykidsagreatschoolinSF_shitisitpossible expedition in 2005 she of course extoled the virtues of her West Portal Lutheran School – imagine wholesome and freckled, God-fearing University of Wisconsin graduates [just off the boat and wondering what the heck brought them to this Gomorrah-by-they-Bay] teaching over-coddled, wound-up Chinese kids [2nd generation and wondering why the hell mom keeps packing their lunch bags with sautéed bok choy in egg noodles and not PBJ sandwiches]) in San Francisco’s outer fog belt – Margaret spent 30 minutes with me describing other private schools in the area that she admired and went so far as to provide their brochures and school rankings (something she admitted her employer frowned upon) so that I could find truly the best match for my 3. Wow, sold! Margaret wasn’t just any school administrator. She had an incredible talent for connection – with students and parents alike – and a kind-but-competent leadership style that would have inspired the best business barons of Silicon Valley (including the vaunted names above). Each morning that my kids left for the school campus I felt an invaluable relief that at least this part of my parenting job – getting them a great education – was covered for now. Any parent understands what this is worth. Somewhere in that ethereal space in space where star dust swirls and babies are imagined, Margaret’s god was holding her destiny wand and watching the assembly belt of passing souls-to-be: hmm not sure, nope not clear on that one either, darn it no freaking clue, …oh my, now for this one I have some very special plans. Of course for every Margaret Finley there is a Snooky, Kardashian (pick any K) or Hilton: individuals with immense wealth and no discernible worth. Spend 5 minutes on TMZ to get many more fine examples of this privileged breed. At least Barney Gumble, daily denizen of Moe’s and Homer Simpson’s burping bar buddy, is not confused about his true value to the world. This topic brings out the old crank in me, I admit it, probably more so since moving to France, where the discussion of one’s wealth or income is considered vulgar to the extreme. Dinner conversations don’t revolve around investments or the price of that BMW in the driveway, but rather the butcher shop that sold you this wonderful lamb, ….and how was it prepared, …and oh that is fascinating, let me tell you MY recipe. You won’t be reading an article in Le Monde heralding (there’s that word again) the 25 richest people in Paris, unless guillotines are being sharpened. Wouldn’t it be interesting to read a list of the 25 worthiest people in the Bay Area? What are the chances? I’ve distanced myself from the school of happiness-through-wealth since turning 50 and because of this I am more comfortable discussing recipes and butcher shops, not home values or anything preceded by a dollar sign. Perhaps I feel inadequate in this topical area now, I am not sure honestly, but there is less pressure to impress with intangibles such as wealth and more interest in exploring authentic worth. I think this is healthy; I know it is more interesting. There is nothing wrong with enjoying one’s just rewards, but we have become a nation so obsessed with money – amassing it, displaying it, and defining ourselves through it – that the definitions of worth and wealth have become intractably entangled. If there is reason for hope it is with our young, many of whom are showing a greater interest in altruism and less obsession with affluence than did my generation. (I just read a fascinating article to this effect but cannot find the source. If you happen to come across similar articles, please share.) We are a leaving them a world of rising temperatures and falling employment. Perhaps they realize that the toll road to Shambala is paid not with flaunted wealth but with valued worth. What do you think? A quick word on a different topic. Maurice Sendak – Where the Wild Things Are – was interview this week by Terry Gross on her NPR program, Fresh Air. Sendak is in his 80s now and not in great health, and he provided a fascinating conversation about his work, the value of relationships, and his thoughts on life. To Terry’s question on what really matters, he responded simply, “be in love with the world.” This reminds me of Thich Nhat Hanh’s observation that miracles are not found in magic men walking on water, but in ourselves walking on earth. 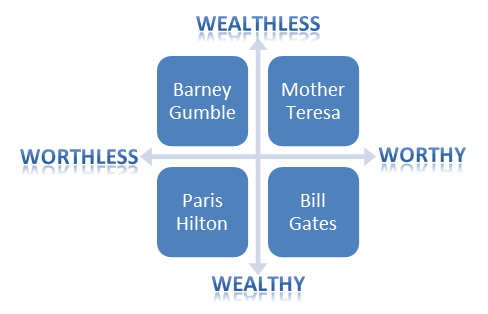 Nice framework…I wonder if there would be a general consensus over which quadrant people would fall, as worth can have a cultural and personal belief system angle to it.